Booth guy at SHOT said it was their CBP submission, who spec’ed the DP cut. Last edited by wilco423; 02-10-2019 at 04:15 AM. Hopefully they release the RMR adapter kits for the Pros and M17s. Last I had read the submission was for both DPP and RMR compatibility. With SOCOM picking up the RMR type 2 there needs to be an available kit for the M17 too. Ive seen a picture of the prototype, but it wouldn't surprise me if they restricted the kit to authorized buyers so they can keep pushing their own optics. Who has these in stock? I picked mine up at Lone Star Tactical Supply, (832) 478-9604 in Houston. 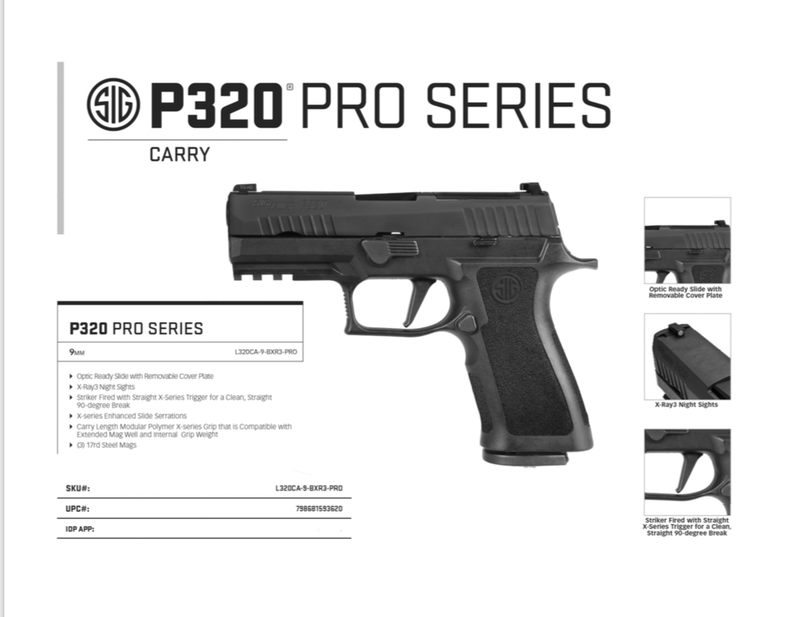 Pretty much our only Sig LE dealer. He has both the Carry and full size versions in stock right now. Thanks. Any word on the new VTAC? I'm giving these a hard look... I think I may be able to live with the DPP footprint. With the Army and ICE contracts specc'ing that cut, seems to me that the footprint is here to stay for a while (and DPP-> ?? adapters would probably be a thing given the amount of guns in service). Do you happen to have the SKU for the 3.9" variant? I can find the 4.7" online, but that's not the one I'm looking for. They are out there, my distributor called me and asked if I wanted any. I haven't seen one in person yet though. Last edited by Texaspoff; 02-10-2019 at 04:59 PM. The CBP solicitation specifically excluded the rear sight being mounted to the optics cover plate so the gun in the photo you have would be a no go for CBP. That is why the pro series was developed. The M17/18 was spec’ed for the DPP footprint and SIG is supposedly making a Romeo optic with the DPP footprint. If there is a military contract for M17 optics with a DPP footprint, I’m sure Trijicon could whip up an RMR with a DPP footprint. In fact given it was specified for the M17 I’d be surprised if Trijicon had not prototyped one already. SOCOM is sticking with Glock so there is no official need to be able to mount an RMR on an M17. Last edited by HCM; 02-10-2019 at 06:11 PM. The CBP solicitation specified it had to be capable of taking both the DPP and the RMR footprints. I’m guessing there is an RMR adaptor plate ?